Alex Rogers is a Professor of Conservation Biology at the Department of Zoology and a Fellow of Somerville College, University of Oxford. He obtained his first degree in Marine Biology at the University of Liverpool and a Ph.D. in the genetics and taxonomy of marine invertebrates also at Liverpool. In his early career Alex held Research Fellowships at the Marine Biological Association, Plymouth and at the University of Southampton’s National Oceanography Centre. Since then he has lead the Core Programme on Biodiversity at British Antarctic Survey and then moved to the Institute of Zoology, Zoological Society of London, where he became a reader in marine ecology. Alex is currently a Commissioner for the International Commission on Land Use Change and Ecosystems for the Global Legislators Organisation for a Balanced Environment (GLOBE International). He has recently been the Chair of the SCOR Technology Panel on New Technologies for Observing Marine Life and is a UK representative on InterRidge Steering Committee. 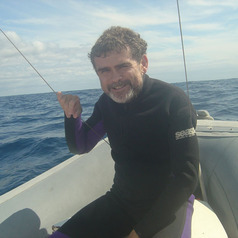 Alex is the Marine Invertebrate Red List Authority for the IUCN Red List (Species Survival Commission) and is also member of the Marine Conservation Sub-Committee and Invertebrate Conservation Sub-Committee of the SSC. Alex is also the Scientific Director of the International Programme on State of the Ocean (IPSO). (i)	The ecology and evolution of Southern Ocean Chemosynthetic Ecosystems (Funded by NERC). This is a collaborative project aimed at identifying the role of Southern Ocean in the evolution and biodiversity of chemosynthetic ecosystems globally. During this project we have discovered new deep-sea vents in the Southern Ocean and have studied the biota around them. (ii)	The ecology of the seamounts of the South West Indian Ocean Ridge (Funded by GEF, UNDP, IUCN, Total, CENSEAM and NERC). This projects addresses global questions related to the maintenance of hotspot ecosystems around and on seamounts. It is also focused on the distribution of the fauna of seamounts in the Indian Ocean, one of the least explored parts of the deep ocean. Finally it will provide important ecosystem-level information for the management of deep-sea fisheries within the region. To date the project has completed a cruise on pelagic biology where important new data on the trophic basis of seamount fisheries was gathered and a new species of large deep-water squid was found. (iii)	The ecology of cold-water coral ecosystems (Funded by EC Coralfish Project, The Lighthouse Foundation, NERC). This project focuses on understanding the distribution of cold-water coral ecosystems and the potential impacts of fishing on them. It includes work to understand the connectivity of populations of deep-sea corals using molecular methodologies. Project locations include the NE Atlantic and the South Atlantic. The project has included some of the deepest investigations of cold-water corals on ridges, the identification of several new coral species and important new information on coral distribution and habitat preferences.